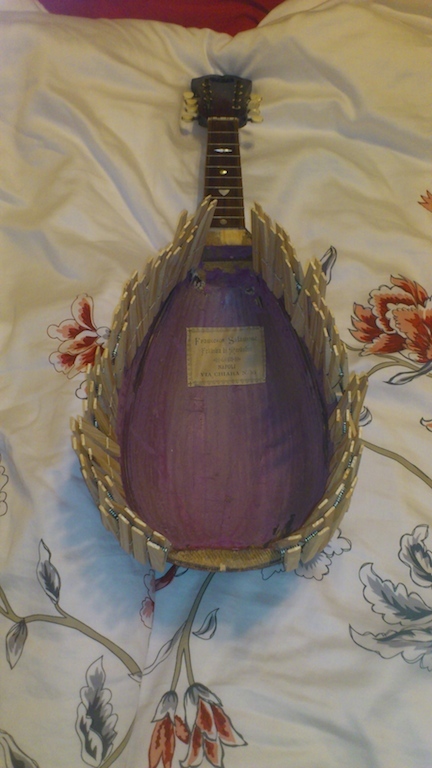 Below you should find a picture of the open mandolin. I guess I am a bit surprised at how coarse the underside of the top seemed. 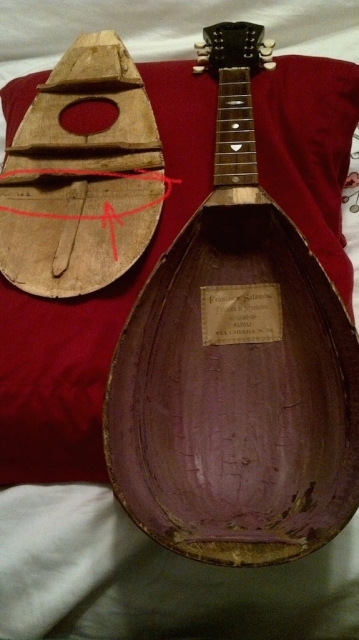 It is well that I opened the top and was able to look at the seams of the bowl with a strong light behind because there are a few more seams that need attention than were apparent from the outside. I trust that when I re-apply the top to the bowl, hide glue will be in order. What a great photo Ray. Thanks for Sharing. Excited to see how you make the repairs and hear you playing you new baby. Time to put in some inside edge linings fer more top support ? I would think that adding "anything" to the inside whether you thought it would help or not would affect the sound and probably not in a good way. I'd go back all original, including the glue. Nice project... keep the pics coming. Is there a rib missing from this location I've outlined in the picture Ray? @cdennyb The line you see is the underside of the "cant". 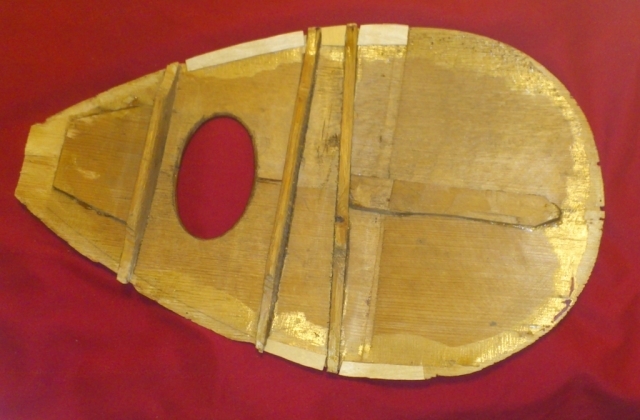 The underside of the top is scored across the underside of the top. The heal of the top is bend downward to get an angle behind the bridge. The new centerline is glued and in this case reinforced to prevent splitting. 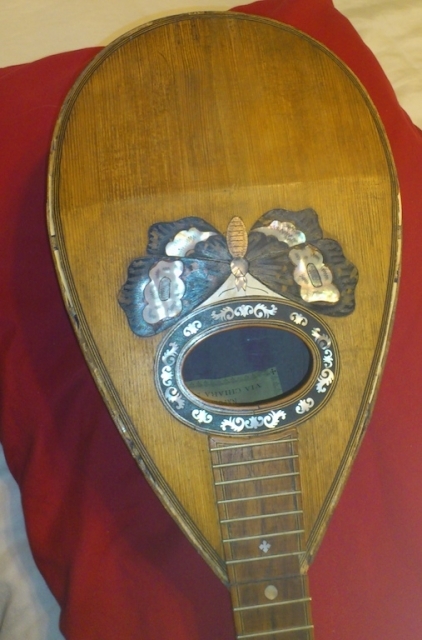 http://www.mandolinluthier.com.....ndex.htm is the site of the luthier I am consulting. He explains that for a period of 40 years the mandolin was THE instrument and they cranked them out as fast as possible. Mine was a lesser builder who didnt use linings weather for cost, time or sonic vibration reasons. "Dave" suggests putting them in for structural reasons. Thanks for looking in Tucs and thanks for your pictures. I note the similarities of construction and the differences. Yours has a reinforcement of the crease in the top, a smaller brace on the centerline. Yours appears to have no reinforcement underside of the neck end. also yours seems have a more definite edge beyond the ends of the braces. 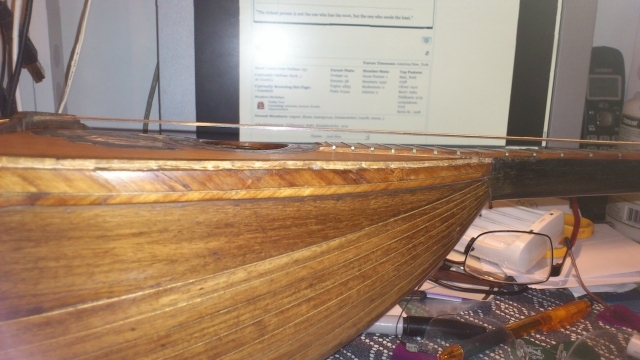 I think I will have to use some veneer to create an edge if only to have someplace to glue the edging. 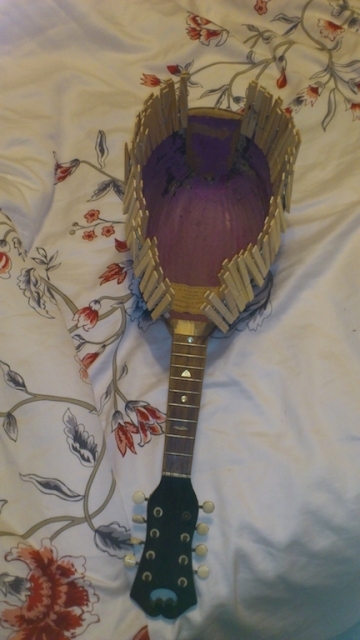 I will follow my luthiers advice and use Titebond to fit the top, I have hide glue but it sets up so fast. I will need more time and Tite Bond will give that AND a secure glue job. 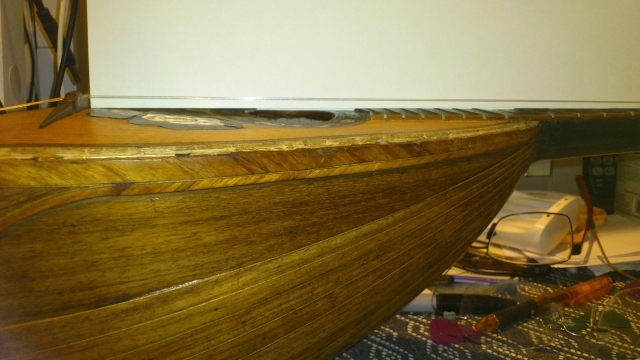 I have rebuilt the underside of the top to provide a more uniform gluing surface. 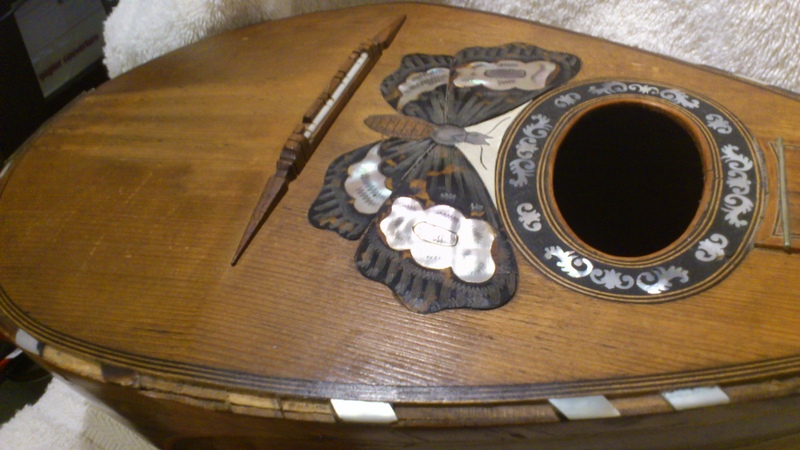 It will also give me a consistent edge upon which to install the decorative and protective edge, probably ebony and maple lozenges in lieu of Mother Of Pearl and Tortoise Shell. I use Titebond for making native american flutes, it holds really, really well -- perhaps too well? I thought the reason for using hide glue was that later you could take the top off if needed. Oh come on now Ray, don't you be usin' that old age stuff as a way to settle for the modern methods. Stick to the ol' ways and do it like you know you want to. Ha. One of the tasks in restoring this mandolin to its former glory is to restore the missing edging. 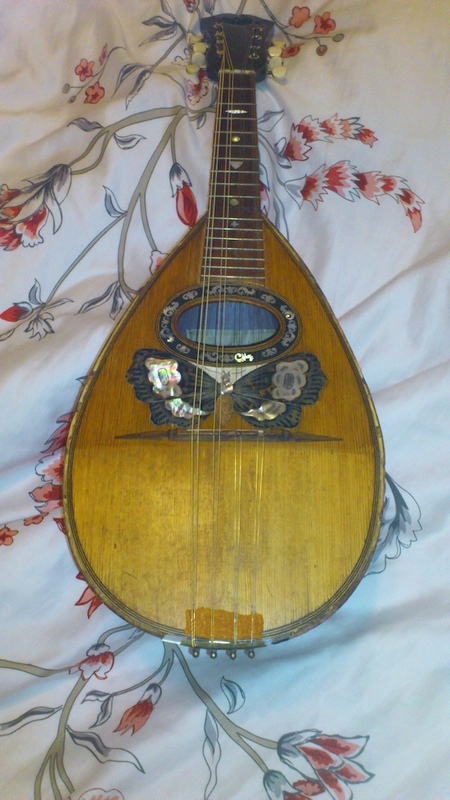 Mother Of Pearl will not be shipped out of the USA and other suppliers want me to buy a sheet larger than the mandolin. Tortoise Shell is prohibited as it should be and again a sheet of artificial celluloid type material is somewhat expensive for the amount I need. 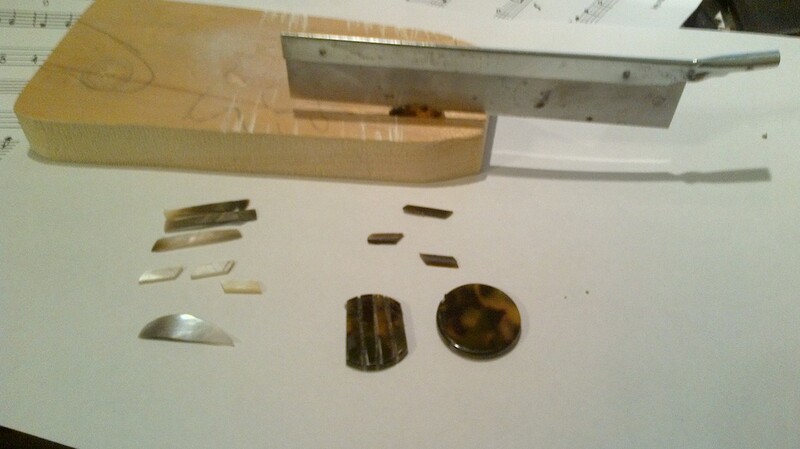 So I have found a source of shell in a beading store for a few dollars and a similar low cost source of 25Cent piece sized fake Tortoise Shell and I am devising ways to cut the material to the sizes I need. You can see my razor saw in position as I double my supply of Fake Tortoise shell by slicing a piece through the middle after cutting a slice off the circle. Way to use your imagination Ray. Good job. Then after a few hours when the glue is set the high tech clamps are removed. 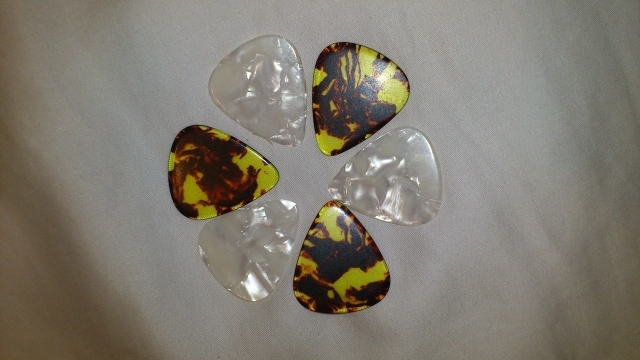 I have also refined my search for edging material and fully engaged my imagination and found celluloid picks at the music store that are fake Mother of Pearl and Tortoise. Stay tuned for final shots of top fitting. Enjoy this thread very much. 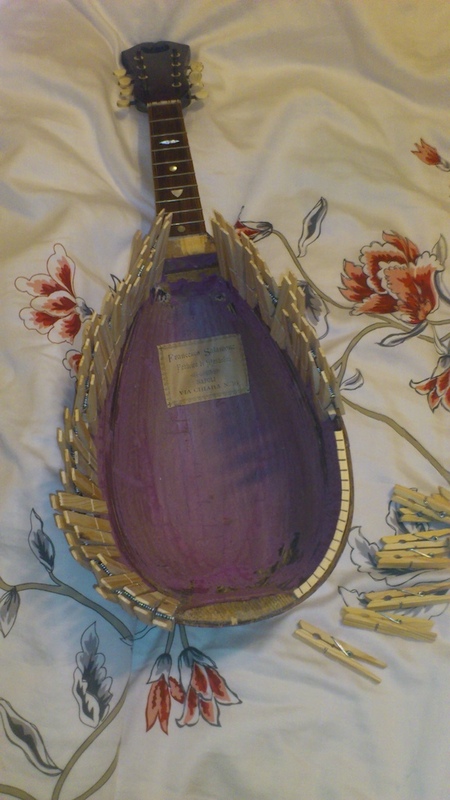 The finger board is off and it did not remain intact, at least 3x as many pieces as the 16 frets. 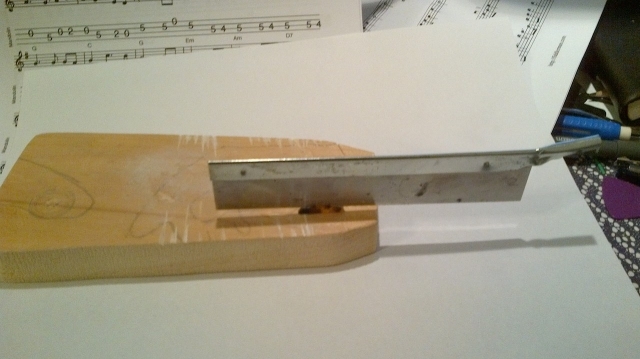 The Finger Board turned out to be less than 2mm thick with a cut about 1mm for each fret wire. 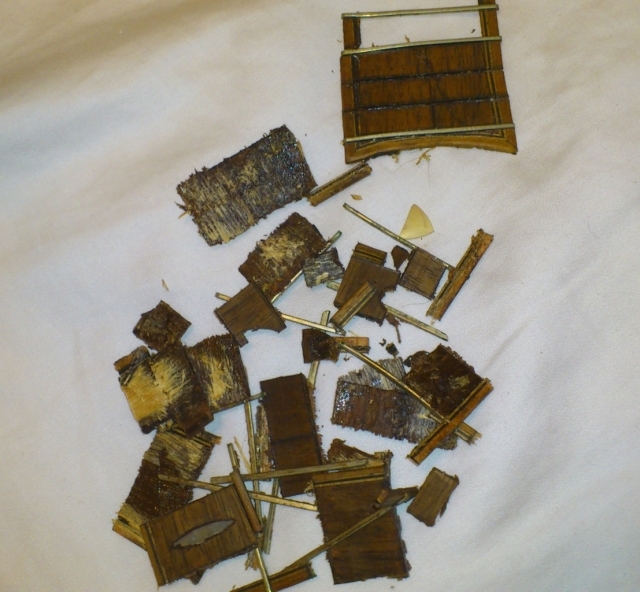 A combination of alcohol and heat from a flat iron, softened the glue to ease removal but almost every fret and fret wire came off individually. 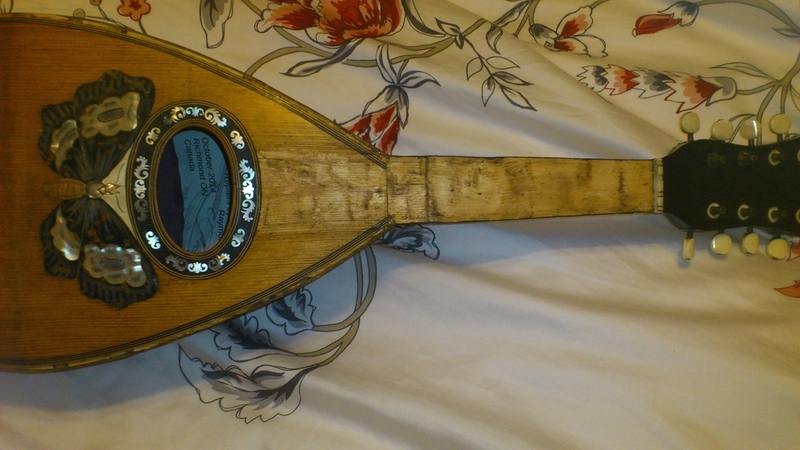 Not to worry however, for less than $50, including postage, I will get a new slotted Rosewood mandolin fingerboard, new fret material sized for the slots, and a new bone nut blank. The advertised thickness of the new FB should almost eliminate the need for a shim and leave me with 2mm or less space between strings and frets. I have a local luthier I can call upon for final fret dressing and setup without breaking the bank. 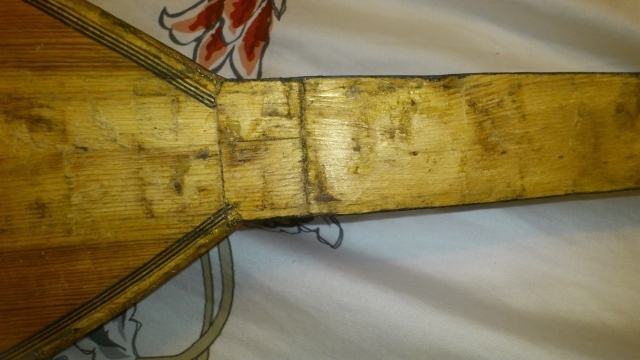 Close-up of neck, notice similarity in the grain of the neck and the top of the mandolin, I think they are both spruce ... maybe a harder wood on the bottom side of the neck but no truss rod in this instrument hence the need for ultra-light strings.